Experience luxury on the Gulf of Mexico at The Palms, a premier condominium resort ideally situated in the beautiful white sands of Orange Beach. The Palms is conveniently located near fine dining, shopping, attractions, recreation & nightlife. Enjoy spectacular Gulf views & access to Cotton Bayou for convenient water craft launching and boat parking at your doorstep. Complimentary boat parking is available for registered guests, call us for details. The Palms offers every amenity discerning guests expect, including spacious living areas, private gulf front balconies, covered parking, four elevators, rubbish disposal on every floor, and onsite maintenance and security to ensure your stay is relaxing and carefree. Whether you prefer indoor or outdoor recreation, The Palms features two enormous swimming pools, lighted tennis courts, well equipped exercise room and sauna. All facilities are immaculately maintained and open year round for the enjoyment of our guests. The sparkling aqua blue waters & sugar white sand are only footsteps away from your door on the private beach boardwalk. Beach chair and umbrella rentals are available for your convenience. Come inside our 2 bedroom/2 bath fifth floor condo and you’ll see that we’ve made every effort to make our guests feel comfortable and ensure that your vacation stay at The Palms leaves you with pleasurable memories that will last a lifetime. Availability calendar, rates and booking info. 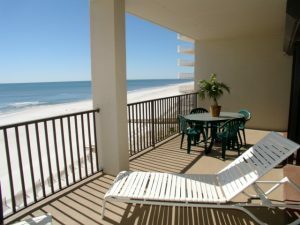 Unit 716 – Enjoy the beach vacation of a lifetime at The Palms in Orange Beach, Alabama! The Palms is located right on those white-sand beaches you’ve heard so much about and condos here offer breathtaking views of the Gulf of Mexico. Ready to hit the town? The Palms is centrally located, so you never have to go far to find something to do. The world-famous Flora-Bama is just a few minutes away and there are a number of charter fishing opportunities throughout the area. Amenities at The Palms are sure to keep everyone in the family happy, whether it’s hanging out at the pool, playing tennis, or relaxing in the sauna after working out in the fitness center.